The Tata Motors Group’s over 76,000 employees are guided by the mission “to innovate mobility solutions with passion to enhance quality of life”. The company’s dealership, sales, services and spare parts network comprises over 6,600 touch points, across the world. Telematics is helping the automobile industry, and particularly fleet managers, take better logistical decisions and improve business efficiencies. Telematics is increasingly becoming an integral part of how automobiles are designed, driven and managed. A research report by Netscribes states that the size of the global telematics business will grow to touch $67.5 billion by 2022. While Telematics is a global trend, the pace and extent of adoption of Telematics in different markets is determined by local market economics and regulations. Markets such as the US and Europe are expected to lead on Telematics adoption due to strong regulations on road safety, emissions and fuel efficiency. For instance, the US has mandated electronic logging device (ELD) to improve road safety by cutting down driver fatigue. Adoption of Telematics across the Asia-Pacific, including India, is still in its early stages. One way to drive faster acceptance of Telematics has been through the OEM fitment route, thus providing an integrated, end-to-end solution for fleet managers. 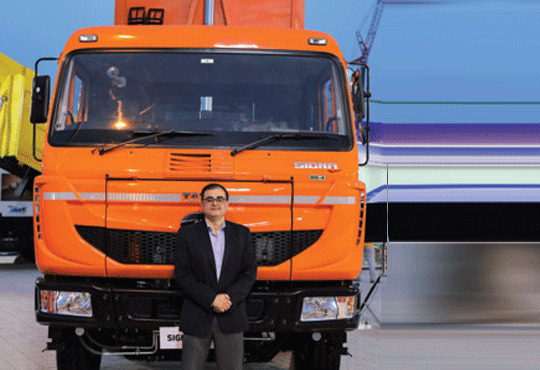 In March 2015, Tata Motors became the first OEM in India to integrate Telematics into its Prima range of commercial vehicles (CVs), under the Tata FleetMan brand. And in October 2018, Tata Motors achieved a significant milestone as the first automobile company in India to roll out its 100,000th CV fitted with advanced Telematics systems. For Tata Fleet-Man, the company has partnered with UK-based Microlise, one of Europe’s leading telematics and fleet management companies. With over 1,200 service workshops, Tata Fleet Man is also closely integrated with Suraksha, the annual maintenance service solution offered by Tata Motors. "The digital technology behind Telematics enables GPS-based tracking, on-board diagnostics and realtime data capture"
Tata FleetMan is now gearing up for next level of Fleet Telematics with advanced trip/journey management features that cater to the complex requirements of sectors like e-commerce, bus operators, logistics companies and others for smart transport solutions. For fleet management companies, the advent of Telematics has meant aquantum shift in running their business. With its help, fleet owners and managers can effectively monitor all vehicles in their fleet individually and collectively on a real-time basis. For example, fleet managers can track vehicles to see the number of hours each vehicle operates, its fuel consumption, whether it is on schedule, deviating from the set route, and even if it is over-speeding. Telematics helps increase efficiency, productivity and hence profitability of fleet trucking operations. E-commerce companies can track deliveries down to the last mile and minute. School bus operators can use Telematics to provide real time information on bus timings to parents. Anothr aspect is that Telematics is an enabler of people safety. Driver fatigue and safety is a universal area of concern for the commercial trucking business. Telematics helps track and regulate driving hours, to minimize fatigue and road accidents. determine where their vehicle is at all times, and how efficiently it runs.